The Fox Hill property in Camden. CAMDEN, Maine — Nearly five months after being declared dead, a proposed high-end, private residential alcohol treatment clinic is back before the town. 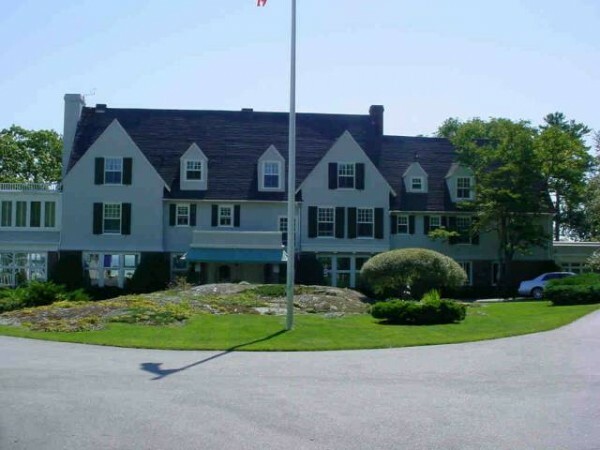 Fox Hill Real Estate, LLC filed a request Thursday with Camden for an amendment to the town’s zoning ordinance to allow the Fox Hill property at 235 Bay View St. to be used for that purpose. Representatives of Fox Hill met briefly with the planning board on Thursday evening. Attorney Paul Gibbons of Camden, who represents Fox Hill, said the first formal presentation before the Camden Planning Board is scheduled for 5 p.m. Thursday, Aug. 1. Selectboard member Donald White Jr. said Thursday night the Fox Hill representatives would like the matter to go before voters at the Nov. 5 ballot. The initial proposal was dropped in early March after H. Thompson Rodman announced he could not reach a deal to purchase the property. He had sought a purchase and sales agreement with the former owner with a condition that the sale be contingent on town approval for the clinic. Since last appearing before the Planning Board, Gibbons said his clients purchased the property, and they now have standing to make the request for a zoning change. Fox Hill Real Estate purchased the property on May 31 from Fox Hill Investments LLC and its principle Ellen Simmons, according to a filing in the Knox County Registry of Deeds. The proposal submitted to the town this week calls for a 12-bed residential facility that would provide “comprehensive and individualized treatment in an unrivaled, world class setting,” according to Merrill Halpern of Fox Hill Real Estate. Massachusetts-based MacLean Hospital, the largest psychiatric affiliate of Harvard Medical School, is planning to enter into a sole tenant, long-term lease of the Fox Hill property, according to Halpern. Fox Hill will be a tax-paying entity, the company stated. The ordinance amendment sought by Fox Hill would prohibit outpatient services. The average inpatient would stay at the facility for 30 days, Rodman had said back in February. The proposed zoning ordinance amendment will be reviewed by both the Planning Board and Select Board, with public hearings to be held by both boards. The final decision on the zone change rests with voters. No date for a town vote has been scheduled. No changes to the exterior of the Fox Hill buildings are planned. Any future changes to the exterior would require approval of the Planning Board, Gibbons said Thursday. In February, the proponents of the clinic said patients would pay $50,000 to $60,000 for a month’s stay.